For your listening pleasure: 2 hours and 46 minutes of pirate radio station, Wolverine Radio--recorded Sunday, February 17, 2013 around 2:40 UTC. Wolverine was broadcasting on 6.925 MHz in the upper side band. Typical of Wolverine, lots of music variety which spans the decades, and no commentary other than station ID throughout. 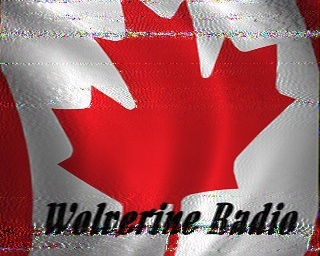 I decoded two of the SSTV images Wolverine transmitted; the Canadian flag (see right) and this one. You can easily decode these live, or via the recording below. Per Ragnar's suggestion, I now use MMSTV to decode SSTV images. The Shortwave Radio Audio Archive (SRAA) is a collection of shortwave radio recordings that you can download or listen to as a podcast. The collection grows every day and includes both historic recordings and current recordings from the shortwave radio spectrum. The goal of this site is for shortwave radio enthusiast to have a place to store, archive and share their radio recordings with the world. Click here to learn how to contribute and archive recordings. You can subscribe to the archive with any podcasting application by subscribing to our RSS feed. Simply right click and copy this RSS feed url, then paste it into your podcasting application's subscribe box. The Shortwave Radio Audio Archive is licensed under a Creative Commons Attribution-NonCommercial 3.0 Unported License.